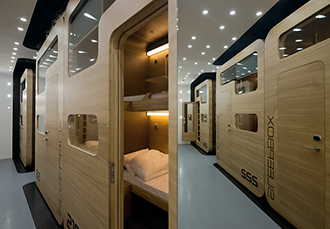 In 2013, the Sleepbox Hotel, Moscow, was conceptualised by the Arch Group. Their objective… to design an innovative new style of micro accommodation to be built in the city centre of Moscow. The result was an award winning 61 bedroom modern hotel suitable for both travellers and people alike. The idea came from expanding on their original development of allowing a space for travellers to nap in busy environments such as airports. The Arch Group decided to convert an old building in the city centre of Moscow into a functioning hotel, using Sleepboxes to produce the luxury boutique hotel. 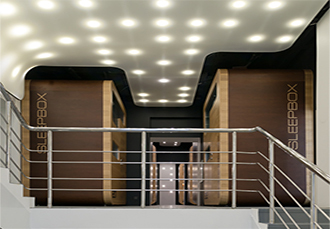 While filling the first 3 floors of this building with Sleepboxes, the ceiling height on the fourth floor was too low for any capsules to be placed. As an alternative to the Sleepbox design, this space was utilised with traditonal style hotel rooms. The hotel has proven to be very popular especially with the convenience of it being a close location to Belorusskiy train station and the Aeroexpress shuttle to Sheremetievo airport and achieves a constant 8.5 out of 10 on Trip Advisor.